Growing up I played Little League Baseball. In high school, I participated in football. I was probably a below average player. Anyway, with both of these sports, there are positions that each member of the team will play. It might be left fielder for baseball, right defensive tackle for football, and even Irene was a goalie when she played soccer. All of these are considered team sports, where you would win as a team or lose as a team. So as I moved into adulthood those team sports fell to the wayside and replaced with a sedentary lifestyle of using the computer. Eventually, I started to add running to the repertoire, but running for me was a solitary individual activity and I did not have any intention of playing nicely with teammates. I wanted alone time and I exactly got that. Sort of sad if you think about it. Eventually running miles upon miles alone, really got lonely. So when I finished the NYC Marathon in 2008, I was prepared to say goodbye to my running shoes. Until Irene said to me that she wanted to run the marathon as soon as I cross that finish line in Central Park. That changed my world. For the next couple of years we ran together and supported each other like best friends do, and again, I was still a bad teammate! However, last year a lot of things happened and changes occurred, with one of them being involved with triathlon. While we made friends with running. Our circle of friends with triathlon seemed to quadruple. The support and inspiration provided by them is amazingly amazing. Not to say runners are not fun, but the insanity of triathletes is really fun. However, if you posted that you wanted to swim at the last, a teammate would show up. Post that you are biking 100 miles, a teammate would be available. 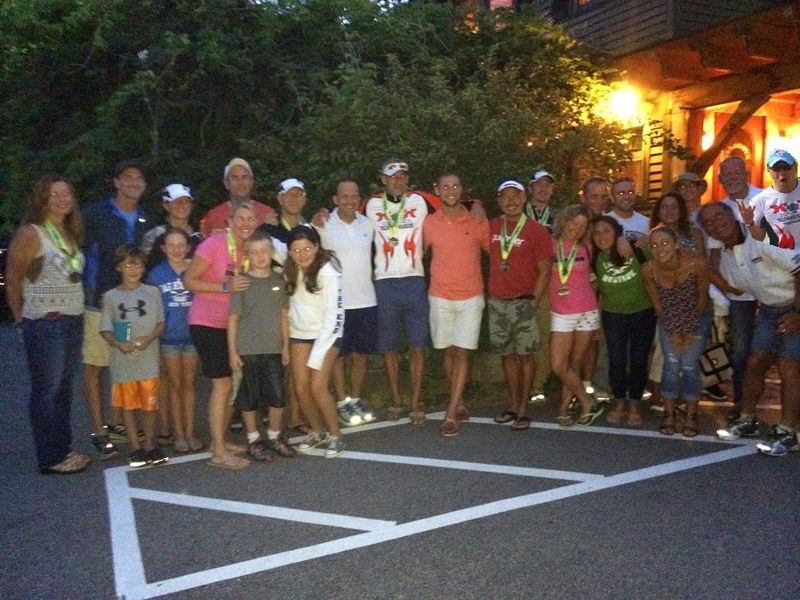 While I felt the love of our team, It was not until I was up in New Hampshire doing the Ironman Timberman 70.3 where I felt that I was really part of a Team. During the race, especially the bike, I had a chance to cheer on my teammates and for them to cheer me on. Even our non-participating teammates cheered for us from the sidelines and taking great pictures. There were about 2 dozen of us in that small town of Gilford that even traveling hundreds of miles away, we still had local support, who would think of driving north and still do a race with people you know. After the race we broke bread, they even photoshopped me into this pic as I was still upstairs settling the bill. The bond even became stronger during the run, when we had a chance to see each other pass by, cheer each other with words of encouragement and provide the all important high five really help as we all worked the 3 loops of the course. Here you can see smiles during the bike turn into grimaces. I especially was hurting as I pushed through the course with an injured Achilles. While I gritted my teeth determined to finish, what really helped were those encouraging words as my teammates crossed paths. It’s always great to hear good things from strangers. It’s really more powerful when those same words come from people who actually know you. A few teammates caught up to me and even paused their run to talk to me, like Karl H. He was also struggling a little because I passed him on the bike. But he is a better running, but he still slowed down to talk about how lucky we are to get to do what we are doing at that time. At the Mighty Hamptons Olympic Distance Triathlon, my IronFit Endurance Team, my coaches team rallied together to support each other on the different legs of the swim, bike and run. It was so cool to know people standing up on the podiums. With Triathlon, everyone is looking to improve and do their best. I think that translates and leaves am impression for our children. You might want to call my Triathlon Teammates, my Triathlon Family. Whatever this thing we have, it’s a great positive thing to be part of! I invite you to be part of the Family. Chilly, Windy, and Lucky to Be Able to Do This!